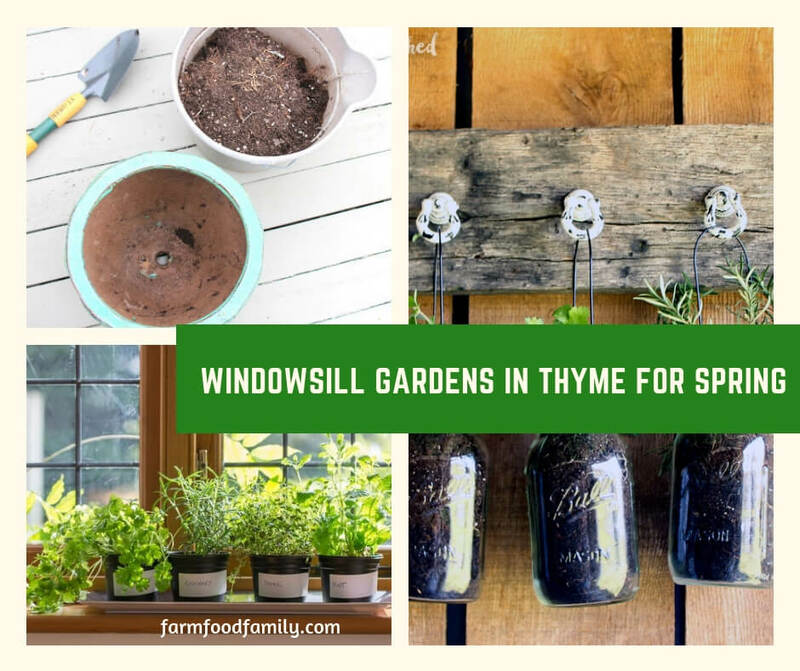 Brighten up the kitchen and celebrate spring with a windowsill herb garden. All it takes is a few plants, colorful containers, potting soil and sunlight. Windowsill gardens are an easy way to invite nature indoors. With a few purchased herbs, several pretty containers, potting soil and fertilizer, even apartment dwellers can enjoy a bountiful garden. All that’s needed to begin is a windowsill that gets plenty of sunlight. To get started, find a sunny windowsill. Herbs require about five hours of sunlight a day, and prefer a south or southeast exposure. If sunlight is minimal, a fluorescent lamp can be used as a supplement. Also, try to find a spot that is free of drafts. Most plants grow best without the temperature fluctuations that drafty rooms produce. Measure the sill’s height, width and depth to select plants and containers that will fit the space. After finding a sunny, draft-free spot for the garden, purchase a few small herb plants from a nursery. Basil, chamomile, chives, lavender, mint, oregano, parsley, rosemary, sage and thyme are fragrant, flavorful herbs. A nurser can suggest plants best suited for the windowsill’s dimensions. Next, invest in several colorful containers. Aim for pots approximately three to six inches deep. Larger pots may fit in the windowsill, but the plants might get too big to keep there. Herbs grown in very small containers may not mature enough to use. A rectangular container is another attractive way to grow multiple herbs. Plants can be artfully arranged to create a mini landscape. Scattering pretty pebbles around the herbs will produce a lovely miniature garden. At the nursery, purchase soil or potting mix. The difference is that mixes tend to be free of soil-born diseases. If soil will be used, be sure to add sand and lime to balance the pH. Either way, make sure that the potting medium is light and drains easily. To ensure proper drainage, pots should have holes or pebbles at the bottom so the herbs do not become waterlogged. Ask the nurser what fertilizer is recommended for the herbs selected. Herbs that will be used in food should receive a fertilizer appropriate for edibles. Applying fertilizer once a month will provide extra nutrients for healthy herbs. Mixing the fertilizer with a little water will ensure an even, thorough application. Growing organic vegetables and herbs is possible for apartment dwellers and those impatient for spring planting. Choose the best indoor garden supplies for success. Place about two inches of potting mix at the bottom of each container. Position herbs in the pot, and fill in the sides and top with more mix. Leave about an inch of space at the top so water doesn’t spill over. Water the herbs lightly. The potting mix should feel damp, not sodden. Over watering will damage herbs. After the herbs have been potted, they will need time to adapt and grow. Once new growth is visible, herbs may be cut for use. Do not cut more than a third of the herb’s foliage. Carefully snip the older sprigs so new foliage can mature. Cutting a bit from the top allows the plant to grow fuller not taller. Plants that blossom may produce seeds. Retain the seeds in a temperate, dry place. They can be planted and placed in another windowsill. Just remember, seeds require a bit more time and effort to grow. Also, the number of seeds and depth at which they should be planted varies with the type of herb. To grow herbs from seeds consult a nurser or conduct a little research. Herbs may be used together or individually in recipes. Basil is aromatic and a wonderful addition to Italian dishes and salads. Rosemary sprigs complement lamb dishes quite nicely. Mint may be used in many Indian and Middle Eastern dishes. Parsley may be snipped and mixed into meatloaf and salads. It is also a pretty garnish. Sage is lovely in stews. Herbs also spruce up beverages. Try a few mint leaves in iced tea. Consult a cook book and make some Mint Juleps for friends. Steeping mint leaves in boiling water will produce an aromatic hot tea that is especially nice on cold mornings. Chamomile makes a soothing, flavorful tea. Many herbs are wonderful additions to soaps and candles. Kits for making either can be purchased at craft stores. Follow the directions and add the herbs as suggested. Lavender, mint and rosemary are popular herbs for these items. Dried lavender sprigs create a fragrant potpourri. Pressed herbs add homespun appeal to scrapbooks. Much of the pleasure in growing windowsill herbs is in discovering new ways to use them. Even if the garden only provides aesthetic pleasure, a little nature brought indoors creates a welcoming atmosphere. With a variety of herbs, colorful containers and potting mix, even city folk can enjoy the fragrance and beauty of a windowsill garden.